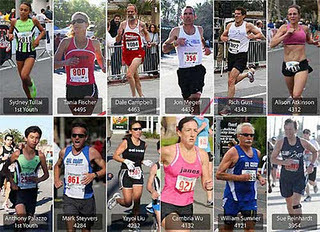 In a show of sustained strength, flexibility, and depth, racers from Club Ed Running completed the 2011 USATF Gran Prix Road Racing Series at the top. For the second year in a row, our runners captured first place in the five-race series, over distances from one mile to marathon, from Brentwood to La Brea. Thirty-six teammates participated during the ten months of races, and when the final race finished at Dana Point on Thanksgiving Day, Club Ed remained the club champion, with 21592 points accrued over the races. (Points are awarded at each race on an age-graded performance basis, with the best five [of nine pre-selected] races scored from each club counting, with the highest five scorers counting from each club in a given race, and with five races needed for Gran Prix eligibility). Second place (20961 points) went to The Janes from Santa Monica (led by Individual Gran Prix Champion Tania Fischer) and Cal Coast Track Club (20833 points) from Orange County (coach Bill Sumner’s talented team). As a team, Club Ed finished first in four of the Gran Prix road races, and in a fifth one at (the Brea 8K), was denied first place by nine points. In the individual Gran Prix competition, our runners were no less impressive. Among 530 Gran Prix participants, ageless Jon Megeff finished second behind the seemingly uncatchable Dale Campbell of Compex Racing, and an ever-determined Rich Gust was a close third. Humberto Sanchez (6th) and Steve Notaro (7th) helped to make it a competitive top ten in the men’s racing group. In the Women’s Division, Alison Atkinson earned second place behind the indomitable Tania Fischer, with Sue Reinhardt capturing 5th and Karina Bird in 7th. Monetary awards will be made to the first five finishers, and the awards will be presented at the first of the 2012 Gran Prix Series events (still to be named). Congratulations and thanks to all team racers who trained, raced, and supported the group effort…anyone up for a three-peat? CLUB ED HOLIDAY PARTY & AWARDS TOO! 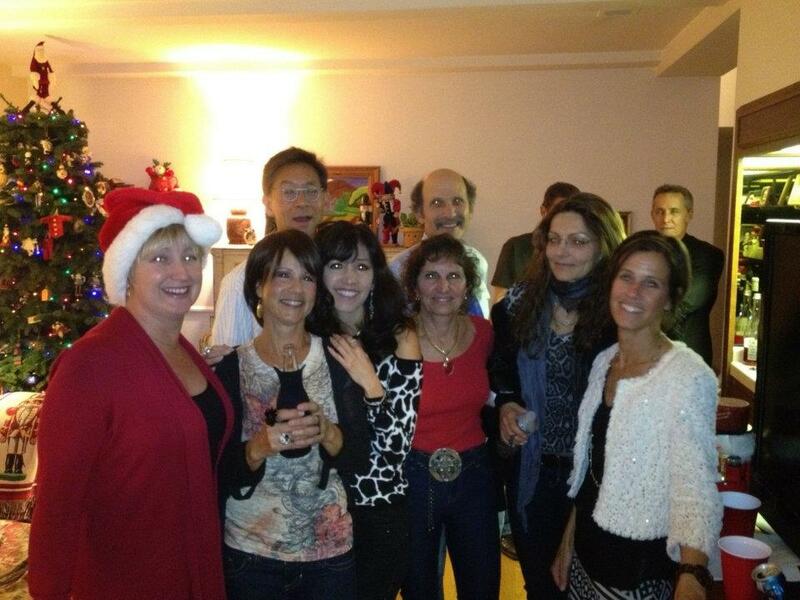 The not-so-annual holiday and end-of-year Club party was held at Coach Ed’s home on Saturday, Dec 10. Several dozen runners and friends stopped to celebrate a memorable year together. We ate, we drank, we laughed, we teased, we helped to recycle 100s of beer bottles, we taunted, we made racing promises we hope we can keep…in other words, a typical get together for the group. A special thanks to Juan Fabian for an amazing (and delicious) Club Ed Cake! Sue Reinhardt and Pat Wickens, for being our most inspirational runners (talent is not limited by age, as these amazing athletes continue to demonstrate). Congratulations to all for a great year; let’s do more and better in 2012! That's right. The ONLY race on Christmas Day will be happening at the Manhattan Beach Pier. In fact, we like it so much we are going to do it twice! Once at 3pm for those who want to get back in time for dinner, and again at 5:30pm for those who want the traditional NIGHT RUN complete with glow necklaces, luminarias, and the lowest tide of the season. Run, walk, or baby jog along the sea by candlelight. Bring the family for a glorious holiday evening of adventure. Register now at mb5k.com! Cool t-shirts and glow necklaces for every pre-registered participant. Unique awards and a chance to stand on the podium for the top five in all 28 age divisions. Don't miss the real luminarias lighting the course and finish under the Christmas lights of the Manhattan Beach Pier. Spectacular! Kids get their own races after the 5k. Choose between the 5k, the 1k, or 400m based on age. Awards to the top 5 and a chance to stand on the podium! Celebrate the Holidays!